TheraLife® Eye Enhanced has been clinically proven to restore normal tear production for those suffering from blocked meibomian glands, clogged meibomian glands, meibomian cysts (chalazion), meibomian blepharitis, meibomianitis, and other problems associated with meibomian gland disease. TheraLife® Eye heals eye oil glands intracellularly – from inside – in combination with our omega 3 supplements, hot compress, and eye lid cleansings. Learn more or buy the complete treatment package today! Meibomian glands are located on the upper and lower eyelids. Meibomian gland dysfunction (MGD) occurs when the oil glands in the eye become inflamed and blocked or clogged. A chalazion (plural = chalazia) is like a bubble of fluid that forms under the eyelid if the eye’s normal secretions cannot be dispersed and become trapped in one pocket of tissue. Meibomian gland dysfunction (also called meibomian gland disease, meibomianitis, etc.) and chalazia often occur together – and in combination with other problems, like blepharitis and dry, watery, crusty eyes. If the eye’s oil glands become clogged, a crust or other build-up will form. The eye can become dry due to lack of proper lubrication. The eye can also, then, become overly watery, if it is trying to compensate for being too dry. The problem is that if you have MGD, there are no oils to thicken the tears, meaning that the tears you do produce – in overabundance – will be too thin and insubstantial to offer real, lasting relief. Meibomian Gland Dysfunction (MGD) is very difficult to treat, and is one of the most challenging issues facing eye physicians. The clinical presentation of MGD includes capped meibomian glands and foamy tears. Expression of the meibomian glands may be difficult. The secretions of the meibomian glands can become extremely thickened and have the appearance of toothpaste. The plugged glands can become infected and the patient may complain of recurrent styes. The dysfunctional lipid layer that occurs in MGD leads to a rapid tear film break up and evaporative loss of tears, resulting in dry eyes. Warm compresses (2 times per day for 10 minutes each time) – a hot wash cloth is not good enough; use a gel type compress or a rice- or bean-bag heated up in the microwave oven. In about 80% of cases, daily application of hot compresses to the eyelid followed by lid massage can help restore the normal consistency of the meibum, which in turn restores meibomian gland function. Hot compresses help because the abnormal meibum changes from solid to liquid at a melting point that is higher than the ocular surface temperature; when the meibum liquifies, the glands are no longer obstructed. Omega-3 nutritional supplementation can reduce inflammation and provide more treatment from within the lid cells. Physical probes- Your eye doctor uses a physical probe to unclog your meibomian glands. Laser treatments – Intense pulsed light for your eyes loosens clogging. Thermal Pulsation Heat Wave Treatment- Ask your doctors where the treatment centers are. These treatments are typically repeated every 6-9 month in order to maintain meibomian gland health. 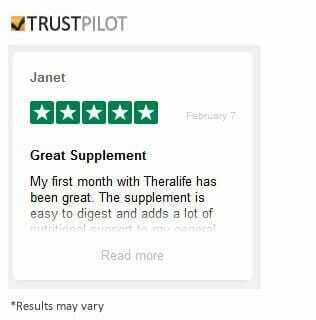 How Can TheraLife Eye Help? TheraLife® Eye provides dry eye relief while reducing inflammation, restoring normal cell function to both meibomian and lacrimal glands. It has strong anti-inflammatory properties. 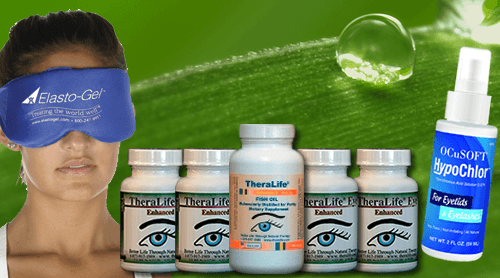 TheraLife® Eye is all-natural, effective, and clinically proven to relief dry eyes with 80% success for first time users. It is your alternative to frequent use of eye drops, which make your eyes drier. Who’s At Risk for Dry Eye Syndrome? Contains everything you need to get started in treating dry eyes, blepharitis, and/or meibomian gland dysfunction (MGD). TheraLife® especially recommends this starter kit to Blepharitis/MGD dry eye sufferers because it includes all of the elements that are essential for getting lasting dry eye relief, collected for you into one conveniently packaged solution.